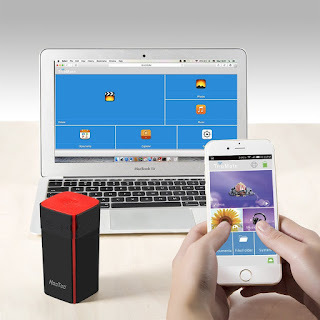 ENDLESS MEDIA STREAMING: Seamlessly stream your videos, photos, and music to your connected TVs, media players, Chromecast, Roku, and other DLNA devices. Also can share your precious photos and videos with family and friends using the TripMate Plus mobile or desktop app. The TripMate HT-TM05 is the only multi-use gadget you need when traveling or working that complements your active tech lifestyle. As a portable device, the small size hides three very different but powerful features. 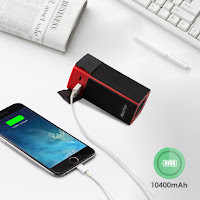 Whether you're on-the-go and need to charge your phone, wanting to create a personal hotspot, or need to share files with the family, the TripMate HT-TM05 is perfect anytime anywhere. TripMate is Powerful, BUT: 1. Cannot be used for IP camera FTP path; 2.Cannot work as a proxy server;3.The Ethernet port can only be used as a WAN input port;4.No app for Windows Phone OS;5.It supports NTFS/FAT16/FAT32/EXFAT formatted disk. Tripmate is currently unable to sync with media files stored in iTunes to USB storage devices due to digital rights management (DRM). I'll be honest, I've had this little device for about 2 weeks now and I'm still learning how to use it. Set up was a bit tricky and a little confusing at first. I had to read the manual a few times, and I'll admit, that could just be me. I definitely liked it as a battery back-up, especially while traveling. It does last a long time, but then when it needs to be charged, it takes a while. I have used it to file share and free up some space on my computer and that was pretty easy to do. I love the router or a wireless bridge function, especially if you're staying in a hotel. However, setting up the interface was very confusing. You have to decide between the two. The router will convert a wired network (Ethernet cable) to wireless and the bridge connects to an already existing wireless network to create your own secure Wi-Fi network. I suggest reading the instruction very carefully to understand. Once I got it set up, it worked good. Overall, it's small and light and easy to travel with. It's a good little gadget to have while traveling. Once you understand it, it's good. 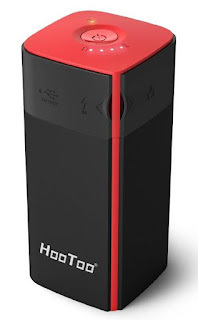 If you would like to try this for yourself, you can purchase these HooToo Wireless Travel Router, USB Port, High Performance, 10400mAh External Battery Pack Travel Charger - TripMate Titan right now from Amazon! 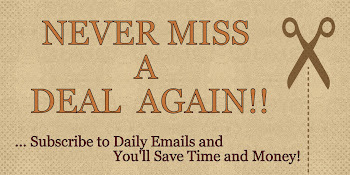 Here's a discount code for my readers. Use code: 8TWPTS5A for $10 off a TripMate. Coupon valid from September 14-28 only. Want to win a NEW iPhone 6S? Visit HooToo for complete details.